Hi there. In recounting my father’s (Eddie Green) life in the entertainment business on this blog, I have also been writing a biography of my father. Eddie died in 1950 and I am now in the year 1949 when he began to experience his medical problems. So, I am almost finished with my first draft, minus add-ons and proofreading. I have deliberately let this blog lag behind the book so no one will get the whole story before the book comes out. I have to leave something for which folks will clamor. Or, not. I have shared in my “Hookups” post about a radio show that Eddie was on in 1935, “Uncle Charlies Tent Show” starring Charles Winninger, and about Eddie being on the Rudy Vallee show, and about Eddie appearing in and writing comedy sketches for “Hot Chocolates” in 1929, with the music of Fats Waller and Andy Razaf, and Louis Armstrong. And today I would like to share a bit of my father with you, as he appeared on the first public broadcast demonstration of television. Woo Hoo! First, however, I am going to post some information about Mr. George Wiltshire. George Wiltshire was my father’s “straight man” in an act Eddie had going in 1936. I needed to do some background searching on George before writing about him, so yesterday I looked him up and while doing so I became aware of the fact that there are a lot of people who have had successful careers in show business of whom we no longer hear. NEW YORK CITY, July —Eddie Green., popular stage, radio and screen comedian, and George Wiltshire, well-known “straight-man,” are the two men of color chosen to lend their bit to the first test television broadcast by the Radio Corporation of America. The program was specially broadcast to a select group of listeners and watchers. 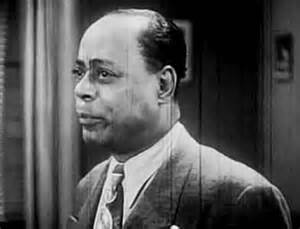 The program, announced by Milton Cross, also featured Ed Wynn, Graham MacNamarra, Henry Hull and the Pickens Sisters. July 7 – At David Sarnoff’s request for an experiment of RCA’s electronic television technology, NBC’s first attempt at actual programming is a 30-minute variety show featuring speeches, dance ensembles, monologues, vocal numbers, and film clips. It is shown to 225 of RCA’s licensees on 22 centimeter screens. (Eddie) “75 people were coming from L. A. to New York and they only had 10 minutes for lunch. (George) There were 75 people and they only had 10 minutes for lunch? (Eddie) That’s right. (George) I bet it scared him (grandpa) to death. (Eddie) It didn’t even scare the waiter. Grandpa was back in the kitchen smokin’ a pipe. The waiter just walked over to the kitchen door and yelled “HAM AND EGGS FOR SEVENTY-FIVE”. (George) And what did grandpa say? (Eddie) TAKE ‘EM AWAY BEFORE I BURN THEM! Ha ha, so funny. I didn’t even get the joke for about two weeks, probably because I was so busy focusing on the white lips. I got over it, though. I love seeing my father on stage, especially since I was only three years old when Eddie died. I have come to realize that Eddie put in the work necessary to get where he eventually got. I actually found the script for the joke in the library last month. I did not put the film up on the internet, but I thank those who did. I thank Mr. Wiltshire’s people, if there are any left out there, for the chance to bring him a bit of recognition. And I certainly thank those of you who have stopped by and are hanging in here with me.